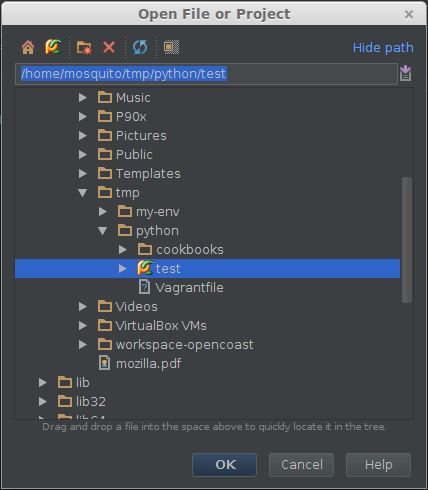 Internet Mosquito: How to setup Vagrant + Chef + Pycharm or... "how to become a Python happy coder"
How to setup Vagrant + Chef + Pycharm or... "how to become a Python happy coder"
Today I'm going to write about how you can setup Vagrant (for those of you that still don't know what Vagrant is, check this link) and Pycharm (to me the best Python IDE out there) to be able to debug remote applications with Pycharm that are running in Vagrant. Also, we will have a quick look at Chef, that will help you configure your Vagrant stuff way easier. So unless you've been living in a cave for the last couple years, you probably already heard about Vagrant and Chef. If you have some experience working with virtual images, Vagrant will become second nature to you pretty quickly. Actually, Vagrant can run on top of Virtualbox or VMWare, so make your choice. So you might be wondering why should you even bother about learning Vagrant when you're all covered using a typical VM solution like VirtualBox or VMWare. Well, I'd say, first: is always fun to learn new stuff :D, and second, Vagrant can do things you normally can't with a VirtualBox or VMWare, such as integrate with CM tools like Puppet or Chef, allowing you to customize the instance creation, deployment, etc. As you can see, I'm installing the 64bits Debian based version of Vagrant, but you can choose several flavours in Vagrant site. That said, we have all that we need to start creating our first Vagrant instance. Vagrant depends on a config file named Vagrantfile, and that's basically all you need to know about it (more on this later). So let's create our first Vagrant instance. As you can see this is written in Ruby, and is basically used to specify VM config options: resources, port forwarding, etc. Check Vagrant docs for a full explanation on the available options for this file. And you're in. Vagrant will automatically mount a /vagrant directory that is mapped to where your Vagrantfile is in your local machine. The second coolest thing in Vagrant is the automatic update to whatever you thrown in that folder. If you modify something from your local machine, you'll see it right away within Vagrant and vice-versa. That said, its time to customize this Vagrant instance so it comes with several things packed, I'm thinking of a basic Python dev environment, but you can virtually install anything you want on this Vagrant instance. To do this, you have basically two options: Chef and Puppet. Word says that Chef is better, but I just chose it because it was the first one I've tried and it seems to be widely supported by default in Vagrant. So Chef is used to automatize the installation, configuration and data deployments within a Vagrant instance. Chef uses the concept of cookbooks and recipes to install several stuff: so you have a recipe for installing say Apache, another for installing Java JDK, and so on. 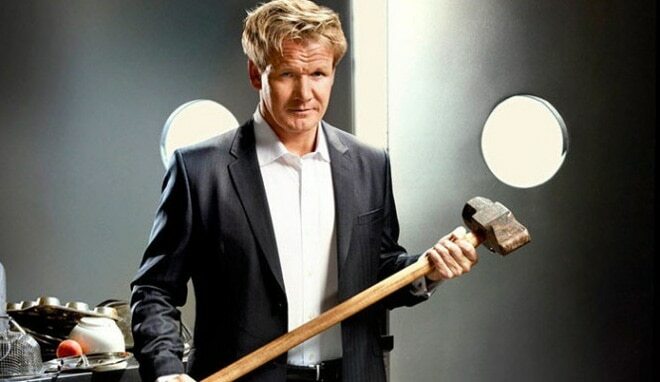 In this case we're going to use Chef-Solo, which is an open source client version of the Chef client that doesn't require a Chef server functional. This is more than enough for the purpose of this article. If you want a deeper introduction to a full fledged Chef installation, I recommend reading this wonderful set of articles from Jason Grimes. The best place to find Chef resources and available cookbooks is here. Now in our case we're going to install a plain Python environment so we can start writing Python code right away. Now we need to tell Vagrant that we plan to use Chef-solo. Easy enough, Vagrant has a great integration with Chef-solo, so simply add these lines to your Vagrant file and you should be able to use Chef. Thus, we will need the build-essential cookbook and the yum cookbook. Yum cookbook has a dependency on yum-epel, so you'll need that one too. To make your life easier, I've zipped all required cookbooks in this file, so you'll only need to extract it where your Vagrantfile is. So once we have all the required cookbooks in our cookbooks folder, we should be ready to try Vagrant. We're all set, if we ssh to Vagrant, we can see that we have Python and pip ready to use, sweet! 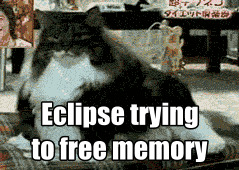 Time for coding! A final note though...I'd recommend using something more convenient for this, such ash Berkshelf. This seeems like a much more decent and maintainable way to resolve cookbook dependencies. I've tried to use it with Chef-solo, but it looks that to work properly it need a full-fledged Chef, so no deal for me, but is worth a look. 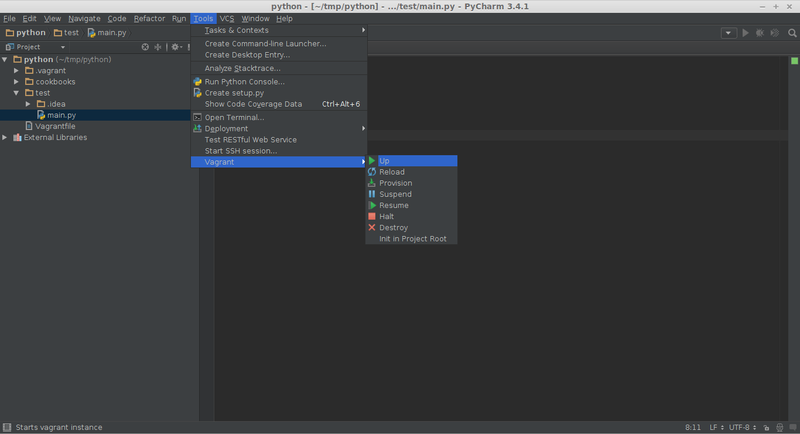 Pycharm is a Python IDE from Jetbrains. 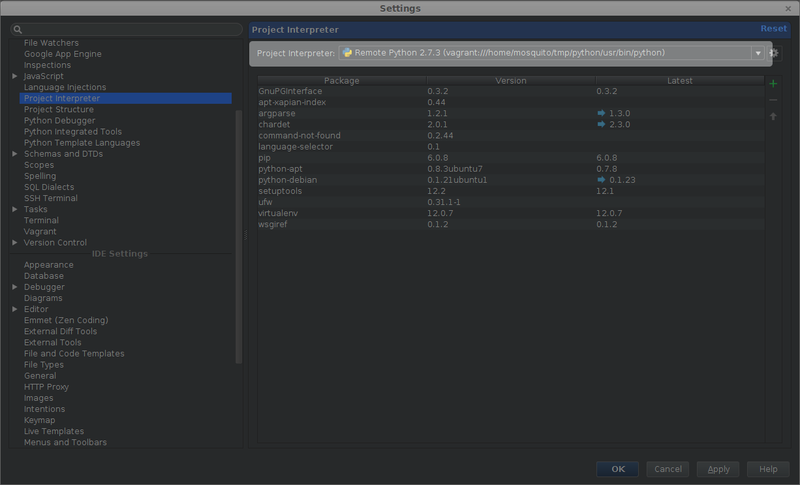 To put it simple, is the best Python IDE I've ever tried, and I've tried some of them. The bad thing is that is not free...well you can get a Community Edition that is free (pretty much like the Java counterpart IntellijIDEA), but to be honest, for the price of the paid one, is worth every penny. That said, let's see how we can debug a Python application that is running within a Vagrant instance, in other words, remote debugging, since your Vagrant instance is a "remote" machine. So let's suppose we have an existing project located where we created our Vagrant instance previously. 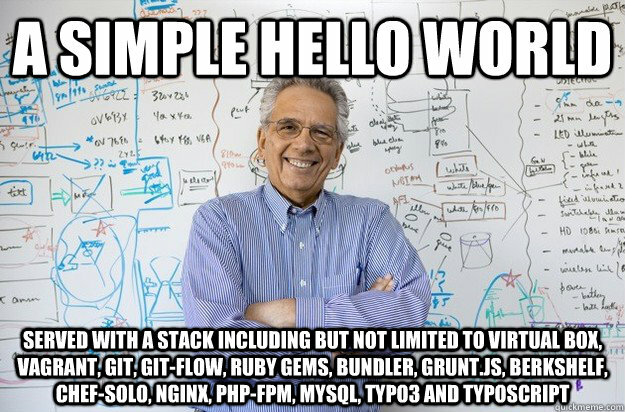 Nothing complex, a simple hello world will be enough for this. So let's start! Probably I've already mentioned, but placing your test project right where your Vagrantfile is, will automatically place the test project file within Vagrant in a folder called /vagrant. You can customize this to more complex situations, mapping any folder in your local system to be available in Vagrant, but this is enough for us now. 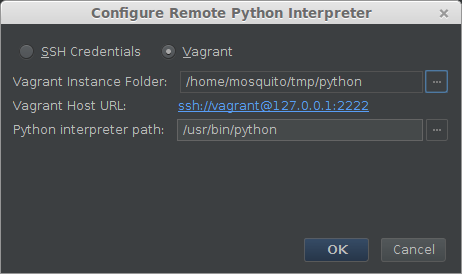 3.- In the next window, select Vagrant and the folder where you created the Vagrantfile, leave the rest as default and click Ok.
4.- Make sure the Remote Python from Vagrant is selected in the interpreted drop down list. 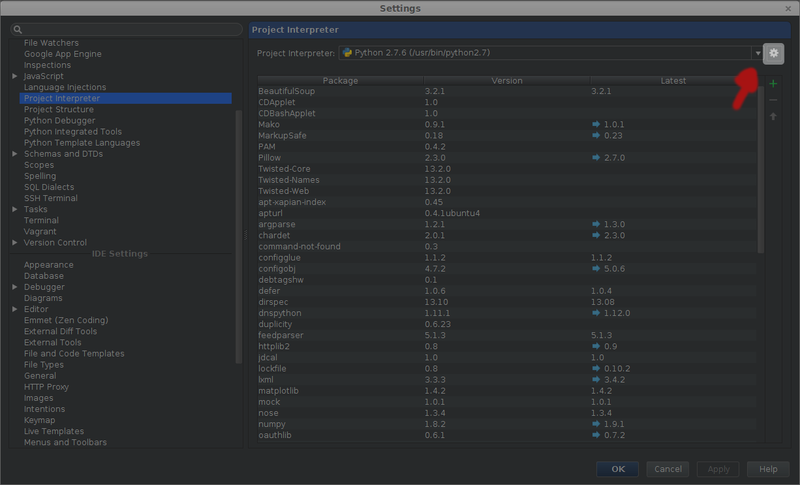 5.- Make sure Vagrant is up, go to Tools -> Vagrant -> Up....isn't this awesome integration? 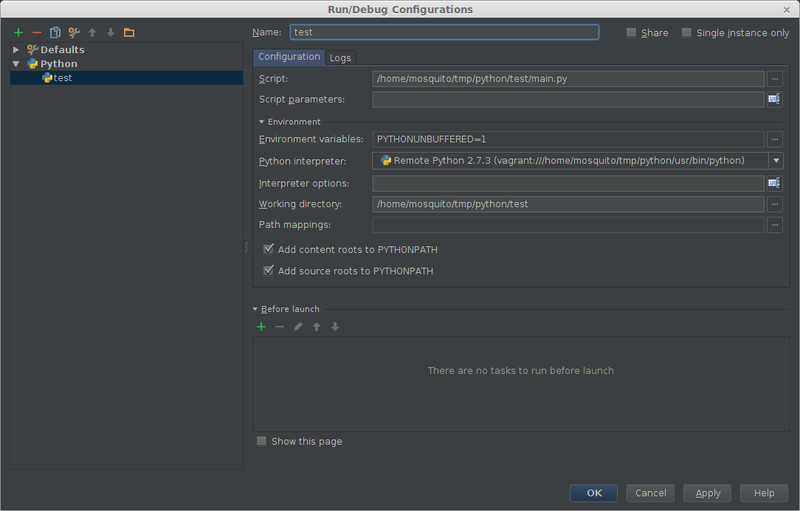 7.- Now we can set up a breakpoint in the main script and see if we can debug remotely. 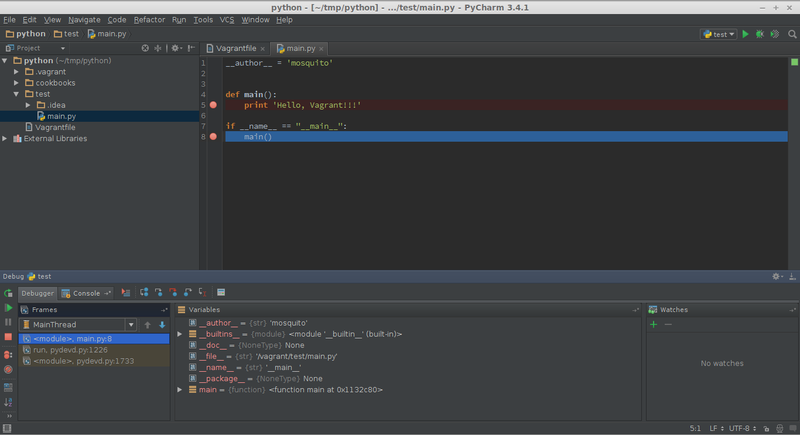 8.- Then hit on the Debug button and we should be debugging our first Vagrant resident Python app....yeeha! So all this may sound like a lot of hassle when you are working on your own, you can skip all this by simply using virtualenv. This is correct and this is overkill if you plan to work on simple or personal projects, but as soon as you need to work with a small-medium team, having some vagrant configuration that only requires you to have vagrant installled to get you up and writing code in seconds is priceless. Other than that, there are alternatives to this approach out there, like Docker. While I haven't tested it yet myself, it looks like debate is not Vagrant vs Docker, but they seem to be able to co-exist pretty well. In any case, we live in a wonderful age where developers have a lot of options when it comes to avoiding all the headaches that setting up specific dev environments can lead to. 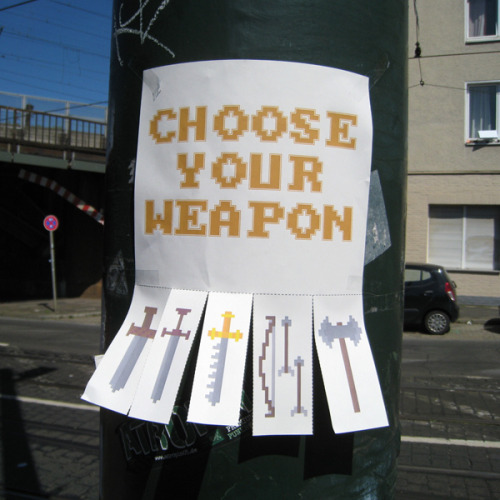 So choose your weapons!